A rich, flavorful, super satisfying soup that you may be surprised to find is ridiculously low in both fat and calories. This thick and creamy puree of vegetables has plenty of light and sweet flavors--making it perfect for the spring season--but enough richness and texture to have any other time of the year. Aside from the tons of veg prep required for this recipe, it's pretty simple once you get cooking. Saute chopped leeks and garlic, then add diced potatoes and vegetable broth and simmer for about 15 minutes. Next, add chopped asparagus and snow peas (or sugar snap peas, which I used for a sweeter soup...plus you don't have to string them), and finally all of the herbs. The recipe suggests chives, parsely, dill, and chervil, but I couldn't find find chervil so I just doubled up on the parsley amount. I also made the mistake of using curly parsley (the recipe calls for flat-leaf, or Italian), but I don't think the overall flavor was affected too much. 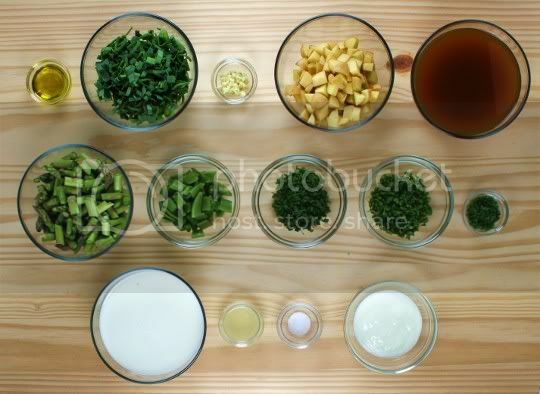 Once all of that is cooked, puree the entire mixture in a blender or food processor. Return it to the pot; add milk, lemon juice, and salt and pepper; and simmer until heated through. When you're ready to serve, the recipe suggests topping each soup with a dollop of yogurt and sprinkle of chives, but I actually chose to just stir them both in at the end. The yogurt adds richness and creaminess to the soup, making it surprisingly thick (and I'm sure the potatoes helped with that as well). 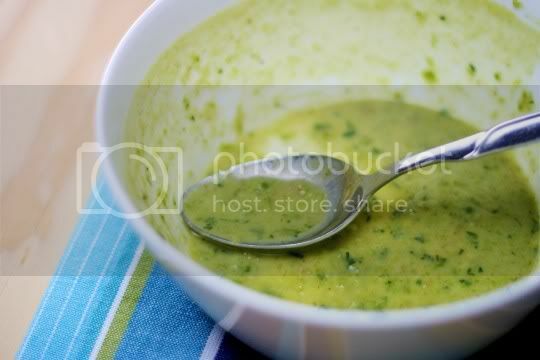 Although it is pureed, the extra chives plus the bits of vegetables that didn't get 100% smooth give the soup a nice hearty texture, so you're actually still chewing bits of veggies. There's a natural sweetness from the asparagus, sugar snap peas, and tangy dill, as well as a noticeable pungence from the leeks. There's also a bit of tanginess from the lemon juice, which really increases the flavors and does wonders for the seasoning. One serving of this soup (about 1 cup) is actually pretty filling, but makes a wonderful starter or accompaniment to a meal. Make again? Yes. Healthy, chockful of veggies, and even yields yummy leftovers. Vegan variation: Use a non-dairy milk and yogurt (or maybe even sour cream) substitute. I make soups all the time in the winter, especially cream soups like this one. 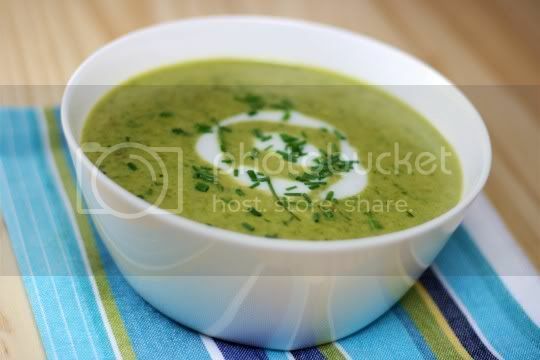 I have never tried snap/snow peas in my cream soups. I would never have thought of that. Thick creamy soups can be achieved by combining the right mix of herbs and vegetables.